Mr. Britt introduces the girls to Bella, the snake. 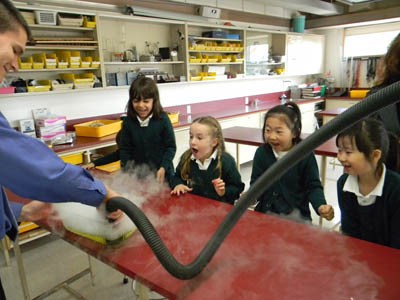 The little school dropped by the science wing at the senior school. Mr. Riendl showed what happens when you mix dry ice (carbon dioxide) and water (and soap! ), Caitlin, Gr. 12, told a story about witch and a spell (“Aabraa kadabbra kalamazoo!”) – with a little help from acid-base reactions. Mr. Ruse demonstrated the chemical reaction of luminol, which glows in the dark (CSI anyone?). 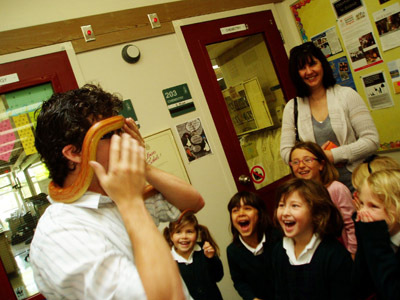 The girls even stopped off in Mr. Britt’s room, where he introduced them to Bella, the snake. Watch the video below. 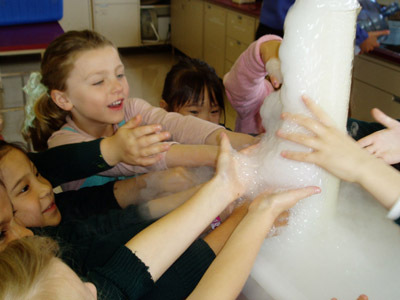 The girls discover what happens when you mix dry ice, water & soap.